Today, Bushiroad has introduced a utility G Unit for Dark Irregulars meant to adjust your hand, power up your field and set up your Soul. 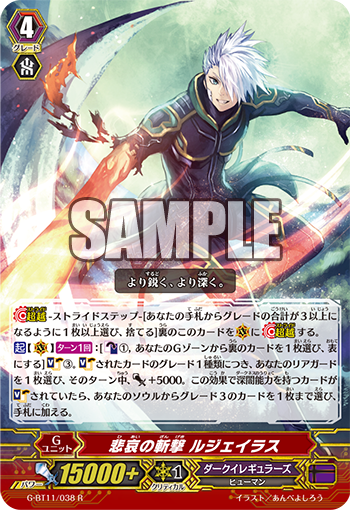 ACT (VC) 1/Turn: [Counter Blast 1 & Choose 1 face-down card from your G Zone, flip it face-up] Soul Charge 3, and for each different Grade 1 among them that is Soul Charged, choose 1 of your Rear-guards, during that turn, it gains Power+5000, and if you Soul Charge a card with the Darkness ability, choose up to 1 Grade 3 card from your Soul, add it to your hand. For Today’s Card, we’re introducing the 《Dark Irregulars》 G Unit “Slash of Sorrow, Lugeirus” from the 11th Booster Pack “Demonic Advent” (on sale June 9th, 2017)! “Slash of Sorrow, Lugeirus” is a superb G Unit with an ability to Soul Charge, strengthen Allies and add a Grade 3 in your Soul to your hand. Its Act ability Soul Charges 3 cards, and for each different Grade 1 card Soul Charged, you can choose 1 Rear-guard to gain Power+5000! From there, you can Power up Units Called during the Main Phase. It works extremely well if you combine it with the Guard restraining effects of “One Who Scatters Sin, Scharhrot” and “Doppel Vampir”! And if you Soul Charge a card with the 【Darkness】 ability with this effect, you can add 1 Grade 3 card in your Soul to your hand. With “Demonted Executioner” and “Glanzend Vampir”, you’ll be able to place a Grade 3 to your Soul in advance. For the foreseeable future, we’ll be introducing cards from the 11th Booster Pack “Demonic Advent”! Please enjoy! Q. With the ability of “Slash of Sorrow, Lugeirus” that “For each different Grade 1 Card Soul Charged, choose 1 of your Rear-Guards, during that turn, it gains Power+5000.”, so when you Soul Charge 2 or more different cards, can you have the same Unit gains a total of Power+10000? A. No, you cannot. You cannot select the same unit.